Social media campaign for hareidi parties to allow female candidates picks up steam - but can it overcome a dominant social stigma? Hareidi women, recognizable by their modest clothing and hair styled under a scarf or wig, are already present in Israeli politics. 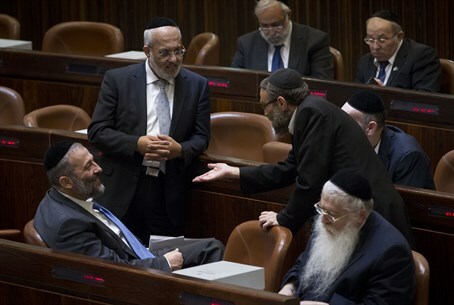 Although they have not been able to be candidates for hareidi parties, some have been elected standing for other parties and others work as assistants to members of parliament. However, they have been held back by both the ban on women's candidacy in their own community's parties and by social stigmas on women in public office - with some candidates facing threats against their and their family's safety over their public roles. In September 2013, Chairwoman Racheli Ivenboim of the Meir Panim-Co'ah Latet food charities was forced to withdraw her Jerusalem city council campaign after she received an avalanche of threats against her. Part of the threats were due to the catch-22 situation within hareidi communities: that while women cannot be elected to public positions within hareidi parties, running under a different ticket - in her case, the religious-Zionist Jewish Home party - is seen as a form of betrayal. excluded from power for the first time in 30 years. The general election will be held on March 17, after Prime Minister Binyamin Netanyahu called for a snap vote following the collapse of the coalition.